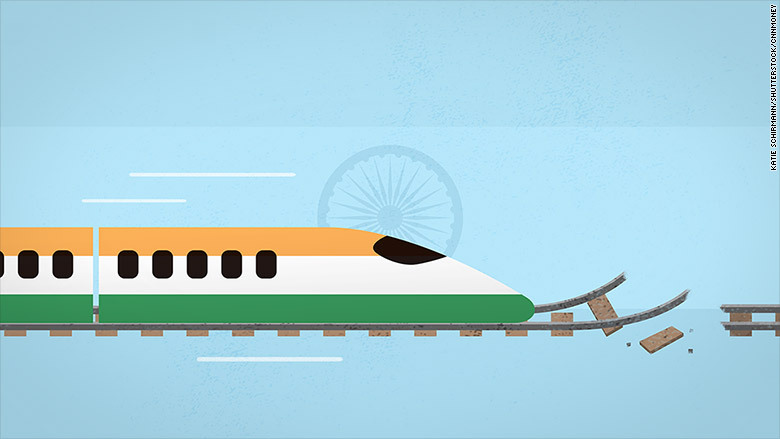 India's bullet train: Leap forward or waste of $17 billion? India is getting a $17 billion bullet train, but it may be the last thing the country's vast rail network needs. Work to build the high-speed link between the western city of Ahmedabad and Mumbai, the country's financial capital, officially began on Thursday. The Japanese government will cover most of the initial cost through a $14 billion loan repayable over 50 years. Prime Minister Narendra Modi and his Japanese counterpart Shinzo Abe hailed the project as a big leap forward for India. Critics said the billions would be better spent upgrading the country's aging and dangerous rail network. "The infrastructure preparedness we need is not in place," Mallikarjun Kharge, a leader of the opposition Congress party, told reporters. The bullet train, he added, is "not economically viable." India's rail network, built by the British over 160 years ago, is enormous. It carries 23 million passengers every day -- equivalent to the population of Australia -- on 12,000 trains over tracks that could circle the globe. But it is also bursting at the seams and has long suffered from outdated and crumbling infrastructure. The government's own figures show that traffic on more than 60% of train routes exceeds capacity. "The capacity has gone up hugely in the last 50 years but demand has gone up much faster than that," said Dheeraj Sanghi, an engineering professor and co-founder of the Indian Railways Fan Club. "As a result, we do not have time for checking if there are any faults," he said. Train derailments happen regularly. 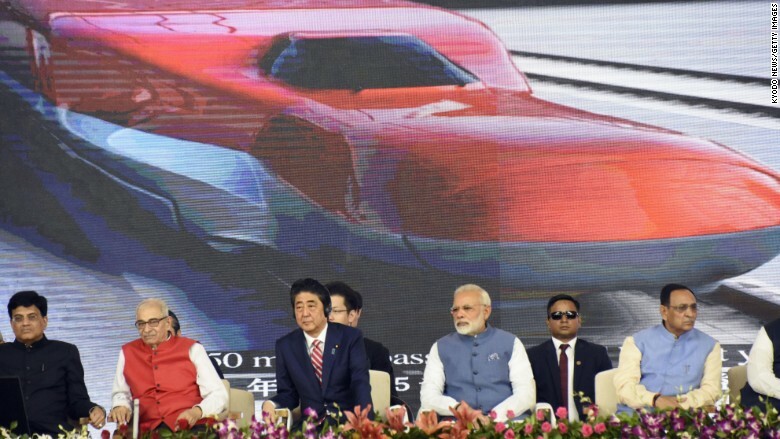 Half a dozen were reported in the past month alone -- including one at New Delhi station a few hours before Modi and Abe attended the groundbreaking ceremony for the bullet train. Around 30,000 Indians died in railway accidents in 2015, according to official data. 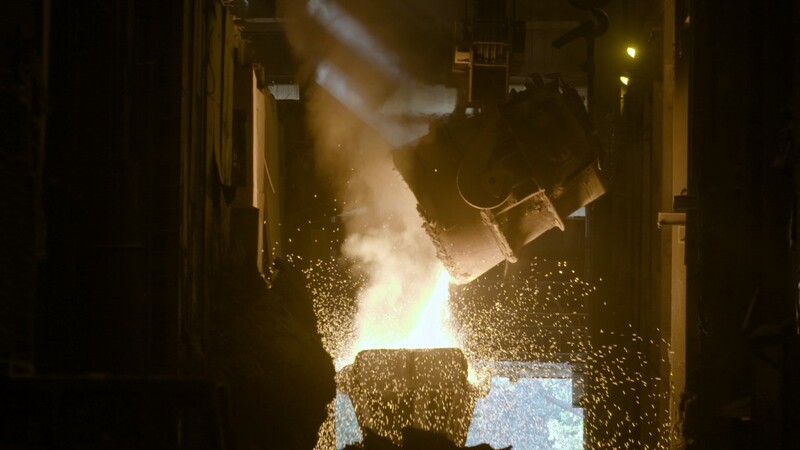 "The system is overstretched, overstressed and [that] has a direct impact on the safety," said Debolina Kundu, a professor at India's National Institute of Urban Affairs. Modi's government has earmarked more than 8.5 trillion rupees ($134 billion) to upgrade the country's railways, including $20 billion just to improve safety, but experts say it might be too little, too late. "That number, while it looks good compared to the previous five years, is nowhere close to what is needed," said Sanghi. "The amount of money that is needed is much, much larger."